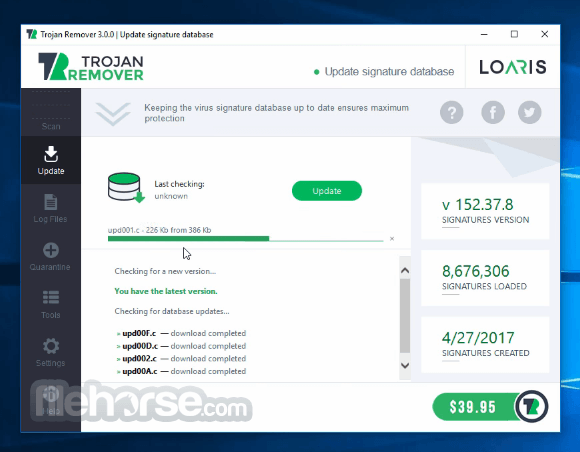 Loaris Trojan Remover is a powerful yet simple solution for malware removal and cleanup of your computer from contemporary forms of online security threats. If you think that your system runs extremely slow and you are no longer able to use its resources completely, it's probably a good time to scan your PC system with recommended malware removal tool. The program will quickly identify all possible viruses, trojans, worms, adware, spyware and other forms of infections. Scan your system with our anti-spyware program to completely get rid of all sorts trojans on your computer. Antimalware solutions offered by Loaris will outdo your expectations, and you will see what it means to have your computer protected by reliable security software. Download Trojan Remover Now! Loaris offers superb antimalware solution to deal with various cyber threats in cases when available security software isn't effective in identifying or deleting them. Let Loaris Trojan Remover to take care of your Windows PC computer protection. "In so many years in a cyber security sphere we have gathered a team of devoted and smart people, who understand the importance of our work. We are using our knowledge to help peope from all over the world and protect them from threats that can cause serious consequences. It is safe to say that computer protection is our speciality and Loaris software is good at this".